Just yesterday, Gorillaz were announced as Coachella headliners, and today they've unleashed Stylo, the debut single from their third album, Plastic Beach, due out 3 March. The animated brainchild of Damon Albarn and Jamie Hewlett, Gorillaz have assembled an all-star cast on Plastic Beach, including Lou Reed, Mark E Smith, Snoop Dogg, De La Soul and Super Furry Animals' Gruff Rhys. If that weren't enough, The Clash's Mick Jones and Paul Simonon reunite on the title track. And if that still weren't enough, Stylo features Bobby Womack and Mos Def. You can check it out right here. Pretty damn great, if we do say so ourselves. 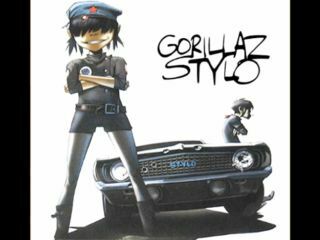 A spokesperson for the band could not be reached for comment about Stylo or the new album, but on his Twitter account, Murdoc Niccals (MurdocGorillaz) not only confirmed that the song is for real, but attributed its leakage to - you guessed it - Russian pirates. "A leak! A leak! Plastic Beach has sprung a leak!" he wrote. "One of those Russian pirates has put a bullet hole on my island! My single's leaked! 'STYLO!' "
Hey, we believe it. Why shouldn't you?